You can use ticket forms to create multiple support request forms. A ticket form is a set of predefined ticket fields for a specific support request. The ticket form determines the fields and data a ticket contains. 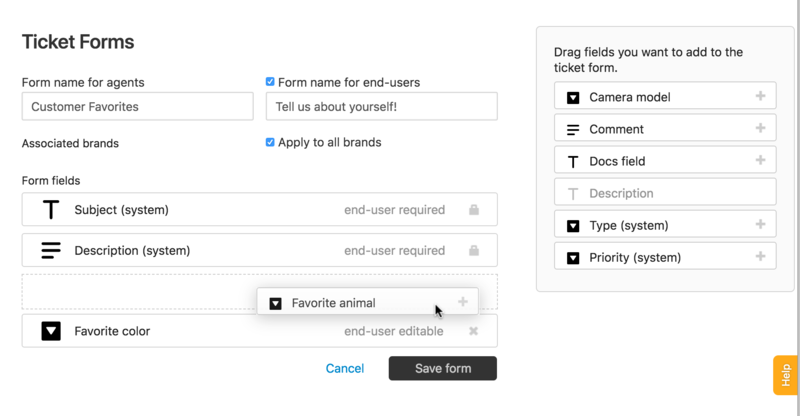 Ticket forms can include system fields and any custom fields you create. Forms can be visible to end-users and agents or to agents only. Customers on the Essential and Team plans only have access to a single ticket form; therefore, many of the topics on this page will not apply. Professional customers (with the Productivity Pack add-on) and Enterprise customers can create multiple ticket forms. Note: For information about managing ticket forms, see Managing your ticket forms. You can create multiple ticket forms for different support requests. For example, you might create different forms, with different fields, for different products. Or you might create different forms for different workflows, such as "Hardware request" or "Refund request." Forms can be visible to end-users and agents or to agents only. If multiple forms are visible to end-users, then end-users choose the appropriate form to submit their request. Ticket field properties are set at the field level, not the form level. So a ticket field's properties will be the same in all ticket forms where the field appears. You cannot set form-specific properties for a field. For example, if you set a field to be required, it will be required on all ticket forms where it is used. You cannot make the same field required on one form but optional on another form. You can use the Conditional Fields app to hide and show fields in your ticket forms. For more information, see Using the Conditional Fields app. Tip: Before you start, see our Guide to designing ticket forms, and check out this ticket forms recipe for software. Click the Admin icon ( ) in the sidebar, then select Ticket forms. Enter a Form name for agents. This is the name agents will see in the ticket form drop-down in the ticket page. If you want the form to be visible to end-users, select the option Form name for end-users, then enter a name. This is the name end-users will see in the support request form drop-down. If you select the option to make the form available to end-users, but you do not enter an end-user name for the form, the agent form name is used as the end-user form name. If you want to restrict the form to specific brands, deselect the Apply to all brands option and click the Associated brands text box to select the brand or brands that should use this form. For more information, see Branded ticket forms. Tip: You cannot set a default ticket form for a group, but you can create a trigger that sets the "Ticket: Form" property. This enables you to set the ticket form based on the conditions you choose when a ticket is created. Add ticket fields to the form by dragging any ticket field from the right onto the ticket form. Alternatively, click the Plus sign (+) to add a ticket field to the form. Note: You can only add active ticket fields to a ticket form. If you want to add a field that is not available, you need activate that ticket field first. If you want to remove a ticket field from the form, click the X to remove it. By default, the ticket form includes several system fields. You cannot remove the system fields, except Type and Priority. Drag ticket fields on the form to rearrange them. The new ticket form appears in the list of active ticket forms. If you create multiple ticket forms that are visible to end-users, you can customize the instructions that end-users see for ticket forms. For more information, see Presenting ticket forms to end-users. You can edit your ticket forms at any time. Click the name of the ticket form you want to edit. The ticket form is updated with your changes. Cloning a ticket form creates a copy that you can modify and use for some other purpose. Hover your cursor over the form you want to clone, and click clone. Update as described above, in Editing ticket forms. Click Save form. The ticket form is created and added to the list of active forms. Is it possible to create a ticket form which is only available to end users who are part of a particular pre-defined organisation within our Zendesk? Any idea when I can make certain fields required on some forms but not on others? Ben Speich - that would really be great to have that option. I also await the answer. Maybe I should have a look at this .. I would like ticketfields to by conditional towards customers. Our customers does not always exactly know what product they have - maybe it sounds strange - but never the less true. I would like to be able to limit the "product" part to show only the products that this customer have. That would make it easier for the to choose. Great feature! Just a heads up that the video on this article is super fuzzy, which takes away from the preview. Just thought you should know. We have different departments that use Zendesk. Is it possible for us to have a different default form for each group, or agent? If not is this something on the roadmap? @Ken - It's not possible to define a default form for a specific group or agent directly. Instead you can create a trigger that sets the "Ticket: Form" property. Using a trigger will allow you to set the ticket form based on whatever conditions you choose when a ticket is created. If you're already using triggers for group assignment you should be able to tack on a "Ticket: Form" action. I'm currently testing Forms and found the system Type field needs to be present in the form template so that the ‘Linked problem’ field also becomes visible, e.g. when trying to link an Incident to a Problem, can the Form field not have the same functionality as the Type field? If you want to use the Problem/Incident functionality, you'll have to use the system Ticket Type field. Can you give me some more information on what you're trying to do? There might be another solution available. So you can see from the ideal setup option that there is no need to have the Ticket Type field included as the values are listed in the form name instead. There would have to be something in the Form admin section to restrict which forms would act as the Problem Ticket Type (as is currently) but having less fields would certainly help to reduce the number of drop down options our agents have to select when raising tickets. Can a completed form for agents be set up to email an enduser? I'm not sure I understand exactly what you're asking, can you provide an example of what you're trying to do? Have you looked into using the capability to Notify External Targets? Thanks! That seems super useful. However, is it possible to get ticket details (comments/conversations) into a email target if the target recipient does not have a ZD account? Any advice on when to create multiple forms vs having one form and just using the conditional fields app? It really depends on what you want your user experience to be. Can you tell me more about your use case? Our team's plan is professional. but I can't add the new Form. I can see 'ADD-ON' in professional plan, what does it mean? My question is similar to Jamie's. We want to build a form similar to the one at support.zendesk.com. For example, the first question identifies the issue, and the ANSWER dictates the next/distinct form. We expect to have 3 or 4 different forms based on the answer to the first question. We would rather NOT require a code modification (i.e. use the Condition Fields app). Is there an alternative way to achieve this result so we do not have to modify code? Thanks! When you're on the Professional plan, "Add On" means that a feature can be enabled on your Zendesk account for an additional monthly fee. If you'd like to purchase any add ons for your account, you can contact your Account Manager or our Support team, and they'll be able to help! Anyone know how to move the Type and Priority fields in the default Ticket Form? We are on the Support Plus plan with Zendesk. I don't like that the Type and Priority fields show towards the bottom of the Agent Dashboard (left side). These are required fields, so I need to move these up where they can see these immediately. UPDATE: I couldn't see my changes after dragging/dropping the field order. I logged off and logged back in. I see my changes now. Yay! Thanks for letting us know, Janet! Glad you got that sorted out. I'm using multiple ticket forms that each have unique ticket fields within them so that customers can use the forms to choose a broad topic for their inquiry (Returns Questions form, Products Questions form, Shipping Questions form) and then choose from a drop-down ticket field with more specific inquiry reasons (Under the returns form would "I'd like to make a return" and "I'd like to make an exchange", and under the products form would be quesitons like "what size should I buy" and "when will you restock"). Does Insights provide a way for me to report on all of the unique ticket fields together? I'd like to be able to see all of the inquiry reasons from the unique fields reported together as if they were options from one larger field. Or, is there a better way to track why customers are writing into us via these unique fields? Very handy if you're a smaller company like us that can't afford the higher level plans! I notice that you have a ticket open with Nick right now on this subject. Insights reporting is a pretty huge topic and there are a lot of ways to customize how you report on ticket fields and inquiries. The short answer to your question is yes, Insights can pull in and report on data across ticket forms in one report. You'd just select the ticket fields as part of your attributes. Nick will help you on any specific questions you may have about that. Thanks for your question! I think my query may be the same as Luke's from earlier on in this thread, but I'd be grateful if you could you please confirm if it's possible to restrict which ticket forms are visible to specific end-users? Our business has different levels of support and so we'd like our Basic Plan end-users to only be able to see a couple of ticket forms, whereas our Expert Plan end-users would have access to a wider range of ticket forms - can you tell me if it is possible to restrict ticket access per user in this way? Hope that helps you on your way. I have subscribed just right now to the professional package with guide and support module, but i still cannot create multiple forms?